Menzo Amos Mudge and Ruth Maria Holly with children, Ruth, Mildred and Harold about 1909. All five members of this family are buried at State Road Cemetery in Sullivan Township where ancestors Lucena (??) and Ira MUDGE were the earliest burials. Ruth Maria HOLLY, 1858-1944 was born in Sullivan Township, daughter of Mary WOOD and Joseph Wilson HOLLY. In 1876 she married Freeman WELCH. They had two children, Willard (1877-1881), Leigh (1882 - old age), and possibly a boy born 1887, a few months after the death of Freeman who died at age thirty of consumption (Tuberculosis). 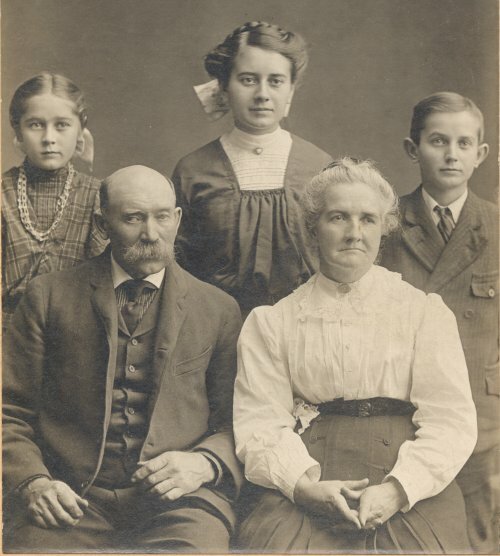 04 NOV 1891, Ruth married Menzo MUDGE and had the three children shown in the photo at left. I was her first great grandchild. She died six weeks after I was born, but my mother managed to get me to see her in spite of gas rationing. Even though Ruth was bedridden and blind she was able to be introduced to her first great grandchild. Menzo Amos MUDGE, 1858-1911, Was born on the Mudge Farm, son of Lucy BRONSON and Amos MUDGE. In 1888 he married Stella WELCH who died in 1889. He died in 1911 on the farm where he was born and lived all his life. He married Ruth HOLLY in 1891. 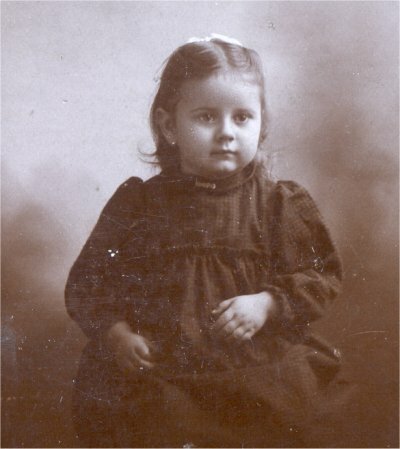 Mildred Ruth MUDGE (1895-1925) was born on the Mudge Farm in Sullivan Township. She married Lee D. Tice in 1914. She died in 1925 at age thirty of a brain tumor. Helen Dora MUDGE (no separate Photo available) (1901-1975) was born on the Mudge Farm. She married George Raymond HILFIGER in 1922 and spent most of her adult life in Towanda PA where she died. 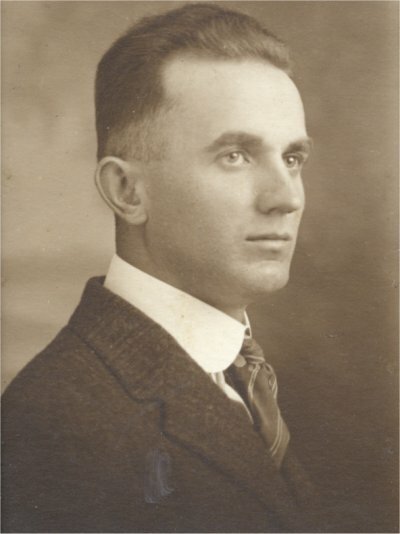 Harold Menzo MUDGE (1899-1954) Was born on the Mudge Farm in Sullivan Township and died there at age 53 of cancer. In 1921 he married Nellie McCarty of Forksville PA whom he met when she was a student at Mansfield Normal School. 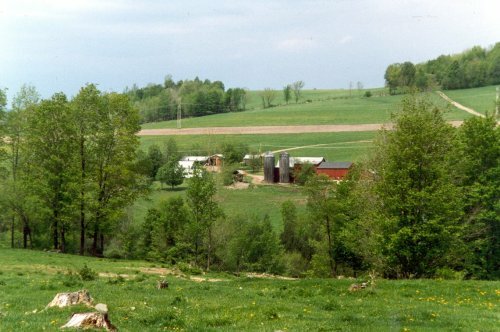 In the photo at left, taken by Joan NASH O'Dell in 1996, the former Mudge Farm can be seen from behind the buildings. This was taken from Route 6.